It is fossil wood - literally wood fossilised over millions of years - so there is no "design", but it looks very "designerly": original, beautiful and contemporary. The red is subtle but strong, helped by the 30% silk. The feel is warm, comforting and wintery, thanks to the wool - and the length for wrapping around. 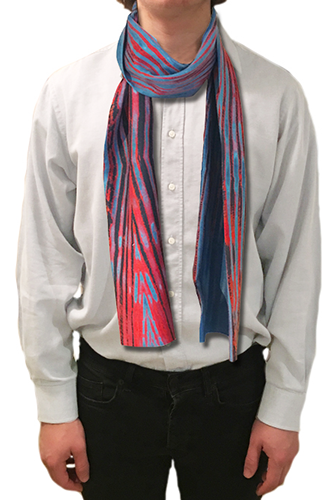 Simply, it's a lovely scarf for walking to work, or walking the dog.